It’s Good Vibe 5 on a Friday at Power Poppy. Be sure to stop by the Power Poppy blog to be inspired by Marcy’s latest 5 topics. How about something summery today? 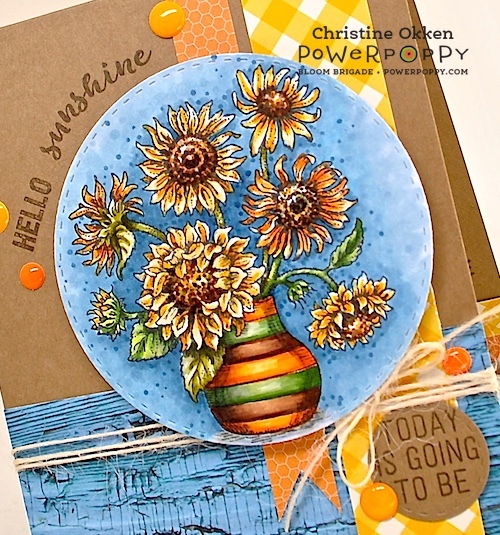 I’ve had this pretty image from Power Poppy’s set, In Praise of Sunflowers coloured up for a while and finally put it together for a card design. I love this sunny display of sunflowers in an earthenware vase. For fun, and to give the yellows some good contrast, I added a deep blue background. Here you can see more of the colouring and how I separated out the sentiment and continued it on the inside. I found some fun paint crackled paper, but it was the wrong tone of blue, so I ran one of the blue markers from the background colouring over the paper to change the tone and match much better. Here’s the inside sentiment to go with the outside. 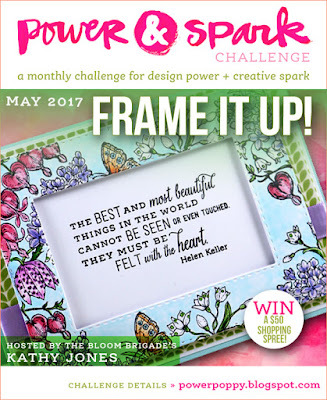 You have just a few days left to enter our May Power & Spark Challenge for your chance to win a $50 Gift Certificate to the Power Poppy store. Be sure to get your entry in! Beautiful coloring, pretty country feel to it! Ho hum, this GORGEOUS image was just laying around waiting for a card... and it's spectacular! I have cards laying around waiting for an image... Love all those colors on the vase. This is such a fabulous color combo. Just yesterday I was thinking about you and designer paper and how beautifully you use it. I'm glad some of my favorite stampers are still playing with paper! Christine so beautiful! 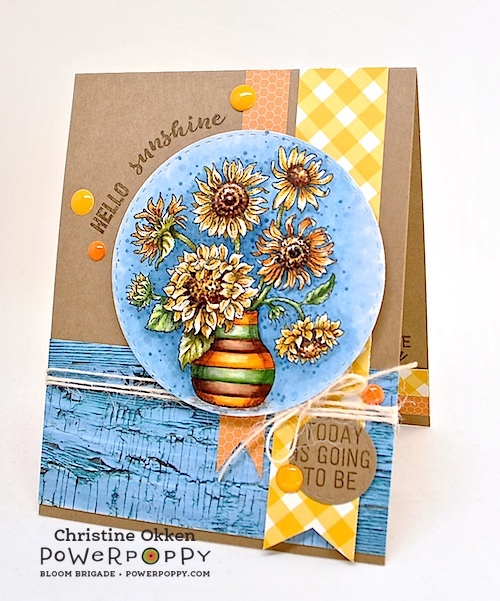 I adore these sunflowers and the colors and design are fabulous. Beautiful!